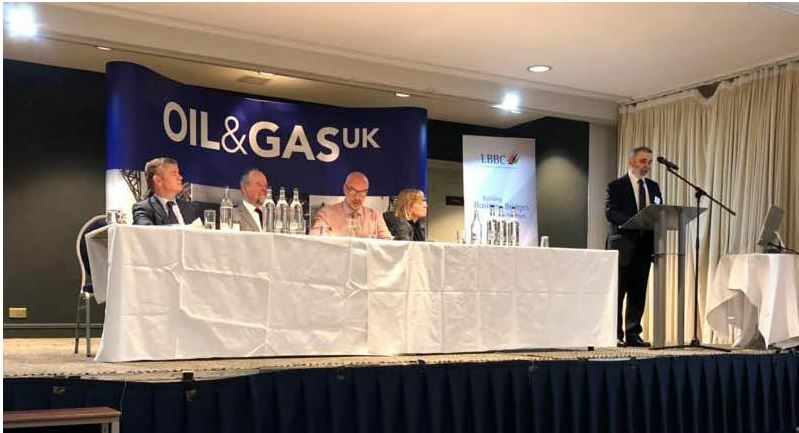 NOC chairman Sanalla speaking at the high-level oil and gas event which opened yesterday in Aberdeen, Scotland (Photo: NOC). 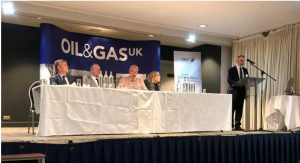 The chairman of the Libya’s National Oil Corporation (NOC), Mustafa Sanalla, opened the high-level forum in Aberdeen, Scotland yesterday. The event, which ends today, had to have a change of venue to a larger hotel due to higher than unexpected participation, organizers, the Libyan British Business Council (LBBC) said. 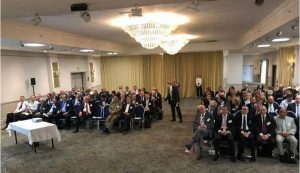 The event was organised by the Libyan British Business Council (LBBC), in association with Oil and Gas UK, Scottish Enterprise and the British Embassy to Libya, led by the recently installed British Ambassador Frank Baker. At the event, the NOC delegation outlined its work plans and investment opportunities for international suppliers, vendors and contractors. The NOC already has historical links with Aberdeen. It is implementing Phase 2 of the Bahr Essalam project with Technip FMC in Aberdeen to connect 10 subsea wells to the existing Sabratha platform. The high-level oil and gas two-day event for the NOC in Aberdeen opened yesterday (Photo: NOC). From the NOC’s perspective, the event is a continuation of its ongoing efforts to encourage international investors and companies to return to Libya, to assist in the enhancement of production life cycles, and oil and gas exploration. It also gives an opportunity to international partners to help underpin the NOC’s ambition to raise production to more than 2 million barrels per day by 2022. The high-level delegation led by Sanalla also included NOC Board Members Abulgasem Shengheer and Jadalla Hamad Alaokali, the heads of the Arabian Gulf Operating Company, Waha Oil Company, Mellitah Oil & Gas Company, Harouge Oil Company, Zulaf Company, Nafusa Oil Operations, Taknia Libya Engineering Company, Akakus Oil Operations, Petroleum Training & Qualifying Institute, as well as general managers and directors of the Corporation.